ZURICH—Switzerland is poised to unveil a massive construction project in the heart of Europe that promises to more closely bind the continent, at a time when much of the public discourse has turned to tightening border controls and division. French intelligence recently warned of Islamists’ desire to let off bombs in public places while security services have mounted several major training exercises in case of terror attack in train stations or stadiums. Tourism industry representatives in the French capital and elsewhere have warned that the industrial action is seeing visitors cancel bookings en masse to the world’s most visited city, only just recovering from a downturn in the wake of the November terror attacks. “The scenes of guerrilla-type action in the middle of Paris, beamed around the world, reinforce the feeling of fear and misunderstanding,” the tourist board said. And on Tuesday the state department advised US citizens to be cautious. 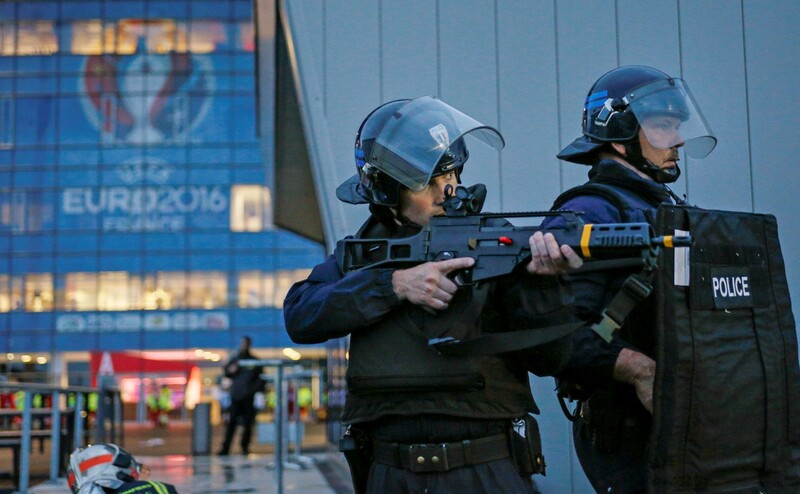 “Euro Cup stadiums, fan zones, and unaffiliated entertainment venues broadcasting the tournaments in France and across Europe represent potential targets for terrorists, as do other large-scale sporting events and public gathering places throughout Europe,” the department said. Euro Cup stadiums, fan zones, and unaffiliated entertainment venues broadcasting the tournaments in France and across Europe represent potential targets for terrorists, as do other large-scale sporting events and public gathering places throughout Europe. France has extended its state of emergency through July 26 to cover the period of the soccer championship, as well as the Tour de France cycling race which will be held from July 2- 24. France has been in a state of emergency since last year’s terrorist attacks in Paris that left 130 dead. French authorities plan on using 90,000 police, soldiers, and private security personnel for the soccer tournament, the BBC reports. The travel alert also draws attention to the Catholic Church’s World Youth Day, which will bring 2.5 million to Krakow, Poland, between July 26 and July 31. According to the BBC, this is only the third time in 20 years the State Department has listed Europe on one of its travel alerts. A report sheds new light on the big-spending travel habits of China’s wealthy millennials, who think nothing of a $500-a-night hotel budget. The report, released Tuesday by Marriott International and the Hurun Report, studied Generation Y-ers aged between 18 and 36, which Hurun Report chairman and chief researcher included a “growing class of second-generation rich kids”. The State Department on Tuesday warned Americans traveling to Europe about risk of terror attacks over the summer. “The large number of tourists visiting Europe in the summer months will present greater targets for terrorists planning attacks in public locations, especially at large events,” the State Department said in a travel advisory. It pointed to two events in particular — the Catholic Church’s World Youth Day in late July in Poland and the European Soccer Championship, which France will host from June 10-July 10 — as potential targets. France has been under a state of emergency since deadly terror attacks across Paris in November 2015 left 130 people dead. While the head of security for the soccer championship told NBC News it was “impossible” make any event 100 percent safe from attacks, officials have refused to postpone or relocate the tournament. The State Department noted that European authorities “continue to take steps” to assure safety and disrupt terror plots, adding that it was working closely with its allies to “identify and counter” any threats. Excitement, adventure, fun — traveling encapsulates these words. And traveling has always had this attractive, romantic aura surrounding it. During the summer, we have time to reflect on what interests us besides our studies, and travel is just one way to satisfy your inquisitive mind. Here are a few of the reasons why we at the Clog find traveling so appealing. When people feel stuck, they’re often told to take a break from what they’re working on. It creates distance to see things from a fresh perspective. Traveling does essentially that but on a grander scale. You get to escape your same old mindset and scenery, and instead swap those repetitive, mundane routines for something new. Have you ever talked to someone back from a trip who isn’t bursting with tales to tell? It’s unlikely. Traveling leaves you with a treasure trove of memories. It’s easy to forget a theory you learned in class or the date of your cousin’s birthday, but the memories from when you travel have a way of sticking with you because they’re usually once in a lifetime. And it’s not just your own experiences you return with — you also bring back all the interesting, weird or funny stories you hear from the people you meet along the way. It’s inevitable that traveling opens up a new world to you, whether that means meeting strangers or coming across a completely different culture. If you want to go full blown explorer mode, here’s a tip: Chuck away those brochures of neatly planned out, cookie cutter tour packages. It may sound daunting at first to venture into a foreign place with no one to lead the way, but once you forgo the obvious tour guides and tourist traps, you’ll be more in tune with the locals and they’ll be able to suggest cool nooks and crannies that a typical tourist may never know exist. Being thrusted into an uncharted territory with new situations may feel awkward at first, but there’s a sense of satisfaction you feel even when you accomplish the smallest of things. There are some lessons you’ll figure out along the way, such as how to bargain at a market so you’re not ripped off. It might even just be learning what delicious, authentic pizza tastes like. So let your spontaneous side loose and travel this summer. We spend months and months cooped up in libraries, hunched over textbooks and problem sets, so take advantage of the three measly months per year when we’re free to explore the world outside of Main Stacks. It could even be just for the weekend. Trust us, it’ll be worth it. And make sure to stay tuned for tales of summer travels from the Clog. Contact Zeyana Musthafa at [email protected]. Rachel Salia was traveling in Bosnia when she met an American who worked for the United Nations and had a car. They decided to put it to use by going on a road trip. Salia, 26, is from Seattle and became interested in travel in high school when she started planning a trip around Europe with a friend. Foreign places like Turkey, Georgia, Armenia, Egypt, Montenegro, Morocco, Tunisia and Malta. She’s now been to more than 30 countries and has spent time living and working in Morocco and Turkey. Salia speaks five languages and prefers to travel alone. She says she’s over the traditional “backpack through Europe” rite of passage that people her parents’ age would undertake after college. “I sort of decided that I was done with western Europe a few years ago, and decided to explore places where it was less likely that English-speaking tourists go,” she said. Other things she’s over: Hostels and partying with other Americans abroad. Topdeck Travel, which organizes group travel for 18 to 30 somethings, recently surveyed 31,000 people under 40 from 134 different countries. They found more of those people had been to Australia and New Zealand, Asia and South America than Europe, and more wanted to go to countries outside of Europe. Another recent study done by the AARP found 13% of millennials are planning vacations outside the U.S. in 2016, compared with just 5% of baby boomers. And the differences don’t end with destinations. Like older generations, people in their 20s are traveling to experience new things and learn about themselves, but they are looking to have more unusual and challenging experiences than simply buying a Europass and staying in hostels. What many parents did after college in the 1970s set a precedent for their children’s travel desires, says Art Webb, the president of travel marketing company BFC Agency. But millennials have taken it much farther, he says, and want first-hand experiences of lives in different places. And when picking their destinations, they have “a clear interest in the obscure,” he said. That’s because millennials want to feel like they’re having the real experience of living in another country, he said, even though it’s hard to avoid being a tourist when you travel. They also want to feel like they’ve discovered something new, not something that lots of other people have done before. That could partially be for bragging rights, and partially because they were raised to value being unique and special, so it makes sense they’d seek the same in travel destinations. “They’re seeking that which is less discovered by others,” he said. In the Topdeck study, 86% of the people surveyed said they travel to experience new cultures, compared with 44% who want to party and 25% who want to shop. And 46% said they prefer to stay in hostels, more than double the percent who said they want a hotel room. Traveling alone in another country is “the ultimate opportunity to get to know yourself and have truly lived experiences that are based on whatever opportunities or gut reactions present themselves,” said Ashley Rodriguez, a 27-year-old from San Diego. Rodriguez backpacked by herself through Southern Spain, Ibiza, Italy and Amsterdam a few years ago, then traveled solo to Morocco, Portugal and northern Spain. She went to alley street parties in Portugal, met people while hostel-hopping and had her palm read on an overnight flight to Morocco. She went to the running of the bulls in Barcelona and road-tripped to Pamplona with a college friend who had been living in Switzerland. “We slept in a car both nights, in awful heat,” Rodrigues remembered (fondly). Rodriguez said she thinks part of the difference in travel trends between younger and older generations has to do with changing lifestyles. She next wants to go to South America, East Africa and Southeast Asia, and recognizes travel is a luxury. Some millennials travel for work and then extend those business trips to visit other destinations. Salia was teaching in Turkey when she took her expeditions. And Carly Nairn, a 29-year-old from San Francisco, calls herself a “travel opportunist,” because she chooses her destinations based on where she can get a free trip. She’s been to Tanzania, Vietnam, South Africa and all across Europe, and most of the trips were for work or school. Others shape their careers around traveling. Brandon Harvey, a 23-year-old from Nashville, is trying to make a career of traveling to unusual places and capturing scenes from them on social media. He says 90 of his trips are paid for by brands or nonprofits he promotes. Mario Scian, a 29-year-old from Argentina, works full time but also has a side gig of traveling to as many places as he possibly can. He’s been to 97 countries, which he documents on his website, and is considering an online poll for what should be his 100th destination. Group trips might call to mind cruises or elderhostels for the over 60 set, but lots of younger people are also doing group travel, either through volunteering expeditions or organized excursions. She’s since done four other group tours, where she’s met friends and her boyfriend. While she’d heard horror stories about group travel, she had no problems. Her guides “were knowledgable, hilarious, kind and so passionate about the places we went” and she didn’t have any issues with other travelers. “I had an absolute ball with the people I met on tour and made friendships that lasted in the world beyond,” she said. Gibson said her grandmother and her mother didn’t have to opportunities to travel on her own the way she has, but sees people her age traveling regularly. Emma Epstein, a 28-year-old from Seattle, has been to Costa Rica four times, as well as Chile, Argentina, México, Guatemala and El Salvador. She’s also traveled across Europe and in Asia. She said she’s found people in her generation are more interested in going to South America — that in some ways the continent fills the European pilgrimage people her parents age made after college. The number of Americans traveling to Central and South America has increased by almost 40 percent over the last 20 years, according to the United States Office of Travel and Tourism Industries. Jamila Humphrie, a 27-year-old who lives in New York City, said her mother studied abroad in college, but didn’t travel much in her 20s. “She did travel back and forth across the United States with my dad in a beat up car — that counts,” she said. And her friends aren’t as interested in Europe. The Greek coastguard has rescued 29 migrants attempting to get to Italy from the Greek island of Lefkada. It is the first time migrants have been picked up trying to cross to Italy by boat since the Greek land border with Macedonia was closed in March. The migrants, including two children aged four and five, were found adrift in the Ionian Sea on Sunday. Their dinghy had apparently been cut adrift by smugglers around 15 nautical miles from Lefkada. Thousands of migrants streamed through the Greek border with Macedonia last year heading for Germany via the Balkans. But border controls have been tightened leaving thousands stranded in Greece, leading to fears many may now risk attempting to get to Italy by sea. The EU’s border agency Frontex yesterday revealed how 13,800 migrants were rescued between North Africa and Italy last week. Meanwhile Turkey yesterday warned that it will rip up a £4.7billion deal with Brussels to stop migrants crossing to the Greek islands unless the EU makes it easier for its citizens to visit Europe. The row threatens to wreck the agreement and re-open the route just as the continent struggles to cope with a mass influx of people into Italy from North Africa. Officials said yesterday that nearly 14,000 migrants had been rescued off the coast of Libya in just the past week. New migrant centres set up to house migrants transferred from the Greek border camp of Idomeni do not meet international standards, a human rights monitor said Monday. Tineke Strik of the Council of Europe gave her assessment after visiting three new reception and registration centres in the northern city of Thessaloniki. ‘I am impressed by what the Greek authorities have done in such a short space of time to create new facilities for the people from Idomeni,’ said Strik, migration official for the Parliamentary Assembly of the Strasbourg-based Council. ‘However, this has been a missed opportunity to create decent facilities that meet international standards. In the places that I visited, there was no privacy, no fire safety, no light and no ventilation and people have no information on their situation or their prospects,’ she added. Strik, a Dutch deputy, visited the new centres on former industrial sites on Sunday and remains in Greece with a delegation of the Parliamentary Assembly visiting several refugee camps in Athens and on the island of Lesbos on Monday and Tuesday. Up to 12,000 migrants found themselves blocked in the Idomeni camp, on the Greece-Macedonia border, after the migrant route north through the Balkans was closed down at the start of March. Many of those transferred to Thessaloniki ‘are hoping to be reunited with family members already in other European countries,’ said Strik. ‘Their psychological well-being will depend on the rapid completion of the pre-registration process and the ability to exercise their right to apply for asylum,’ she added. Under the deal signed by EU leaders and Turkey in March, it was agreed that Europe would hand over billions to fund Turkish refugee camps and loosen travel rules for its 80million citizens if it took back all migrants arriving on the Greek islands. But the agreement is on the verge of collapse because Turkey has failed to meet all 72 criteria set out by the EU for it to fulfil before its people are allowed to travel to continental Europe without needing visas. The main sticking point is a requirement for Turkey to change its laws so academics and journalists can no longer prosecuted as terrorists. Turkish foreign minister Mevlut Cavusoglu yesterday said it was ‘impossible’ for the country to make the alterations and warned the EU again that it is ready to abandon the deal.